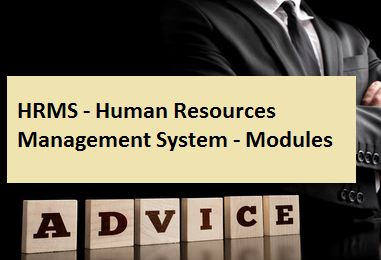 In this article 'hrms - human resources management system - modules', you'll get more information and details help with your career knowledge, feel free to copy or share. The human resources department is one, often overlooked in an enterprise. It is a proven fact that an efficient Human Resources department should function without fanfare. For instance, if a project team successfully brings into market a product on time and within the budget limit, then it is a huge success. When the HR department manages the administration of the enterprise effectively still goes unseen simple because the HR department is mostly called in for when there are problems running in the organization. The reality is very different. The HR department plays a vital role in the smooth working of an enterprise, by tracking and investigating the timekeeping and work patterns of the personnel, giving better information which form basis of forming strategies. However, the significance of human resources does not go unnoticed in the software industry. There is now a large variety of applications obtainable to help the HR department in their functioning. HRM software systems are typically explained by the four basic responsibilities of the HR department, and thus they have separate modules to work towards the needs of each responsibility, which are discussed below. The first one is the Payroll Module. The payroll module to a great extent decreases the work pressure of the HR department by making automatic the payroll process, by allowing HR to make sure that payroll functions are completed on time and without any errors. On the basic level the payroll module is supported by the manual entry made in regards to the timekeeping and attendance data on the paper-based timesheets presented by the workforce. However, in a more advanced system keeps track of the employee’s timekeeping through the automated systems which is further connected to ‘clocking in’ system or in some cases, a tracker which is connected to the computers desktop of the employees. Once you are done with feeding the attendance data into the system, the payroll module on its own works out the payment amounts and the various related deductions such as income tax before generating paychecks and employee tax reports and so on. The second is the Time and Labor Management Module. The time and labor management module is made in such a way to assemble and inspect the employee’s timekeeping information which helps in the organization’s cost accounting. By the process of sourcing the data directly from the timekeeping devices and means used to calculate payroll, this module can ensure management with valuable data in regards to the use of labor resources of the enterprise. Then is, Benefit Administration Module: The benefit administration module is HR personnel with the ability to observe and supervise employee participation in various benefit programs. These programs can be anything ranging from programs related to well being of the employees for instance, the health insurance and pension schemes to the profit making programs like the stock option plans and profit sharing. The HR Management Module comes next. The HR management module enables various HR solutions like, analyses of application data through, basic demographic data of workers and so on. The management module permits HR personnel to successfully handle the Human Capital Pool within the enterprise and within that it keeps track of the training and development of employees and their skills and qualifications. Advanced HR management modules can also used to make automatic the application process for positions by getting the application data and entering it to the required database. In an enterprise Data related to the time usage of workforce can improve the decision making process of the management there by allowing the HR department to get an integral portion of strategy formation for the entire enterprise.